A default ARM compiler (version specific) can be defined for each MCU type. New projects created for a specific MCU type will use the associated compiler. Click Project - Manage - Project Items - Folders/Extensions - Setup Default ARM Compiler Version. The dialog lists all supported MCU types and allows you to associate it to a compiler version. 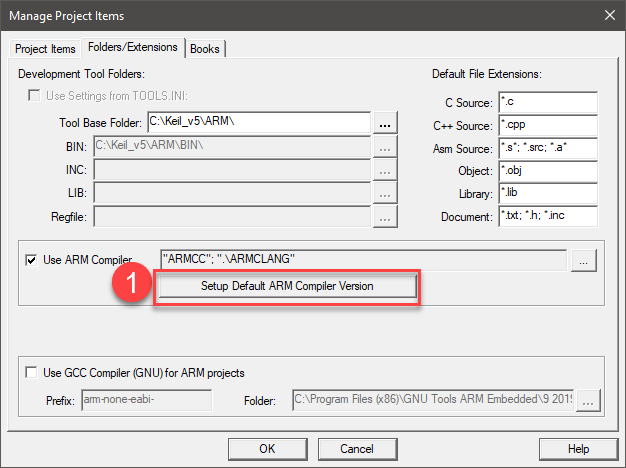 Select the compiler from the field Default ARM-Compiler Version to use. The entry Unspecified : use latest version installed associates the compiler with the highest version number to an MCU type. This ensures to compile your projects with the most actual compiler on the computer. Alternatively, you can select a specific compiler version from the drop-down list. Only registered ARM compilers can be associated to an MCU type. Refer to Manage ARM Compiler Versions to register a compiler. Compiler versions that have been deleted get identified with the entry Missing:. Also, the Build Output window will inform about missing compiler versions. During development, but especially during the maintenance phase of a project, it might be required to use a specific compiler version instead of using the default compiler version. Set the compiler version for each project target individually in the field Options for Target - Target - ARM Compiler. Refer to Application Note 267 Update ARM Compilation Tools without updating MDK-ARM.